Since the development and adoption of Google and other search platforms, such SERP displayers have had to devise a new plan for indexing and displaying reputable and informative search results to its users. Multiple updates have been established for Google that hones the information web crawlers pick up and how they index that information. SEO, or search engine optimization, is a marketing tool that uses particular methods like keywords, coding, media, and more to provide Google with ample relevant information to deliver to its users. This allows your roofing website to be accurately indexed, leading to higher rankings in SERPs and on other platforms. Brand Development: Roofing SEO can help establish your company in the digital world. Search Visibility: Proper roofing SEO helps your website appear in more SERPs. Traffic Relevance: Accurate SEO tactics deliver a more relevant audience to your site. To grow a customer base online, SEO is an important part of the process. In fact, search optimization is what generates traffic, which can subsequently be converted into customers. Of course, having an engaging call to action closes the deal so to speak, but search optimization opens it. Google is the single greatest source of roofing leads in modern marketing, and it is the top resource for most consumers in 2019. While they might be looking for websites, they are often using Google to find them. The same is true of local services, such as roofing, which is why both local SEO and off-site SEO are equally as important as on page optimization. Call (800) 353-5758 to discuss why SEO is important for roofers and how you can ensure yours is better than your competitors. What if My Roofing Company Doesn’t Use SEO? The counter-argument to everything detailed above is “Why even have a website at all?” Some companies will, in fact, try to sell roofers on the concept of a landing page as a replacement for a traditional website. The idea is to generate traffic through PPC advertising and to link the landing page, which will serve as the converter of traffic to customers. While PPC advertising is a very effective marketing tool, having a landing page only does not reflect well on your company and makes it look spammy. PPC marketing, however, works best in collaboration with strong website design, on-page and off-site SEO, as well as local optimization. This full spectrum of presence promotes business growth. The first part of the acronym SEO, “SE” is a dynamic entity. Search engines, and most specifically Google, are always evolving and finding ways to improve their functionality. Because of this, the latter part of the acronym, “O” is dependent on the search engine’s current algorithm. The good news is that Google has outlined strict Quality Guidelines in which all websites should adhere to. Tactics that once generated traffic through manipulative behaviors no longer have that positive effect, and instead, cause your website to incur a Google penalty for black hat SEO. Ethical and encouraged optimization techniques are known as white hat SEO. They are considered acceptable if not commendable by Google. Google’s initiative to improve user experience, especially for mobile users, is a good reference point from which to optimize. Posing the question “what would Google think of this tactic” is instructive and can help SEO’s keep techniques within Google’s sphere of acceptance. 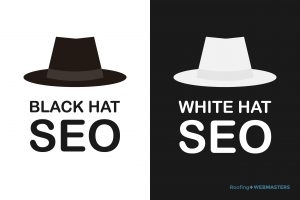 Usually blurring the lines between black hat and white hat SEO is dangerous territory. To discuss the importance of SEO for roofers, call us today at (800) 353-5758. Updated on March 14, 2019 at 4:35 pm by Roofing Webmasters.